Jake Topakas, owner of Jake and Telly’s Greek Taverna described it like this: “This is our 19th annual hospitality expo, one of our most important fundraising events of the year. As chefs, we want to help out our community and our industry, and this is one of the ways we do it…” Ranch Foods Direct caught up with several of our partner-restaurants that were among the 80 exhibitors participating in the huge trade show at the Broadmoor in early March, including Greg Howard and his crew from McCabe’s Tavern, above. 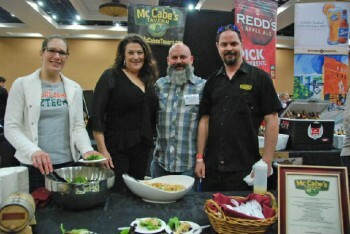 CLICK HERE to see all of the interviews and photos from our restaurant expo recap in our April newsletter.